Apple Computer continues to add finishing touches to its next generation operating system this week with the release expected sometime in the next 30 days. Panther will continue to focus on the user experience and augment its rich-feature set. The release will sport a slew of features aimed at enhancing the user's video viewing pleasures, via updated versions of Apple's bundled QuickTime and DVD Player software. On the audio front, DVD Player 4.0 will deliver support for S/PDIF output —a feature that has been highly anticipated since early builds of the Panther system first surfaced in June. By easily connecting their Macs to a growing number of consumer electronics and home theater products that support S/PDIF input, users will be able to enjoy sound quality that will rival home entertainment systems. The upcoming release will also boast support for DVD bookmarking, sources said. Users may set bookmarks so that they can start watching a DVD-Video disc from where they previously left off. 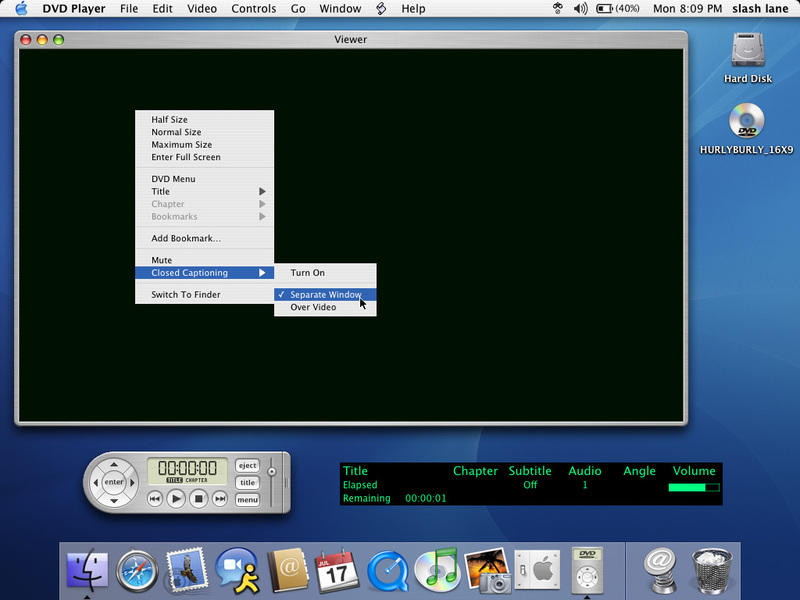 The addition of a 'Go' application menu will provide timely DVD-Video navigation via key command-keys and three submenus; Title, Bookmarks, and Chapter. Meanwhile, an application-wide preference will allow users to specify the action that should take place when a disc starts playing. User's can either set discs to start from the beginning, the last position played, a default bookmark, or be prompted each time via a dialog. Another feature of the new DVD Player is closed captioning support. Captions can overlay the video or appear in a separate window in a user's text color of choice. An application preference will automatically enable closed captioning when the player is muted, if selected. Furthermore, users possessing multiple displays may view video in full screen mode while continuing to work on an additional display, or dim the other display while watching a movie. Finally, iChat integration will mute audio or pause video playback when connecting to an audio or video stream, and users of Quartz Extreme-enabled systems can set the background transparency of info windows and select to fade the revised controller panel when hiding windows.